Ms. Sayuri Tai who is an athlete and member of national team of Japan for the 23rd Deaflympics was a Girl Scout. Ms. Tai sent us message to support and cheer for Girl Scouting. Friends all over the world, please support Ms. Tai at the coming Deaflympics with us! I was an athlete and in my best condition at early 20s. But, I got disease on my right ear and became hard to hearing. 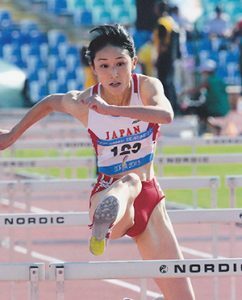 However, I did wanted to overcome the difficulty and devoted all my effort to the athletics aiming the world competition until I retired in 2009. Right after the retirement, my left ear got disease and I lived with hearing aid since then. Once, I lost my dream and goal. Then, “Deaflympics” completely changed my life. I transferred to the deaf athletics just some months later of my encounter with Deaflympics. I had a vague dream to win at the competition, but the dream became clear when I had a baby girl. I hoped to win and bring back a gold medal for my daughter. At the last Deaflympics four years ago, I received a bronze medal. This year, I am keep training every day to challenge a gold medal. I am an athlete of 100-meter hurdles. All athletes always have a goal. I consider well what I should do to reach the goal by myself, determine the programme of training, and implement it adopting circumstances. It is the skill I learnt and developed through Girl Scouting since I was in elementary school. Diverse experiences such as usual meetings, outdoor activities, various events, meeting with lots of friends/sisters and Leaders, empowered my capacity. Also “Be prepared”, the motto of Girl Scouting is always in my mind although the life style is changing through giving birth and raising my child. My daughter is six years old now, and growing cheerfully in rich nature environment. I am surprised and moved everyday with her great sensitivity. I, of course, sometimes worry and embarrass for the first experience to raise children. At the same time, I am looking forward to grow myself as a mother thorough involving society and increasing experiences with my daughter. July 2017, the 23rd Summer Deaflympics will be held in Samsun, Turkey. It is the competition for deaf athletes and we will communicate and exchange in international sign language and/or gestures with athletes from other countries. The original system of games and ceremony using visual information as alternated auditory information, such as starting with a light and waving hands instead of clapping, is fascinating. In 2020, we will have Olympics and Paralympics in Tokyo. Now, it is raising awareness and expanding interests to sports for disabled people in Japan. However, it is less known about the Deaflympics in Japan. I would like to contribute to raise awareness of Deaflympics and sports for disabled people through me and my friends’ play, lecture and events to experience deaf athletics.